Every traveller to New Zealand reads and hears about Queenstown, so they probably wouldn’t consider staying in Glenorchy. But just how many international travellers really know about Glenorchy? Its only a 45 minute drive from busy Queenstown. What I can state categorically, is that the Glenorchy area is the most blissful and tranquil area in the upper Lake Wakatipu region. So why would you stay in Glenorchy? Firstly, if you want to immerse yourself in a much less ‘touristy’ part of New Zealand, its a great choice. 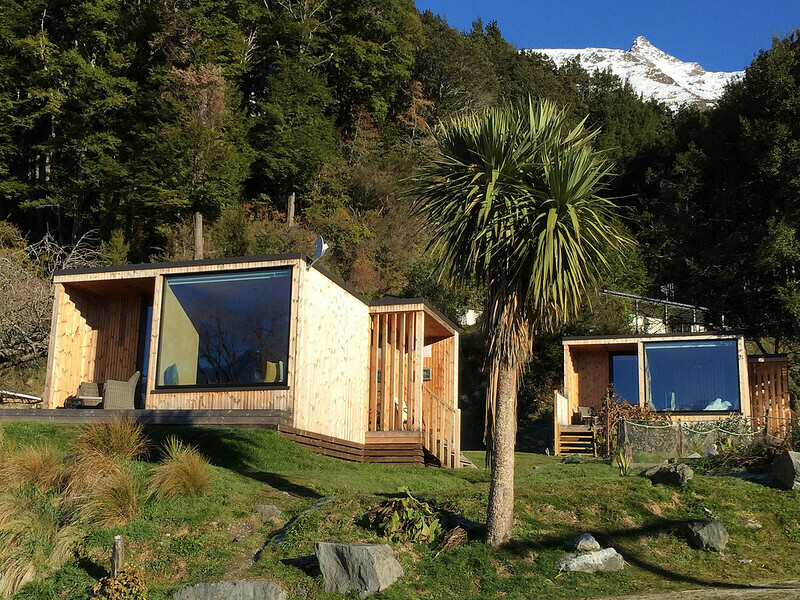 And if you stay overnight, you’ll really love the peaceful solitude – especially after all the day trippers have returned to Queenstown. Visiting the local pub or the cafe, checking the local ‘General Store’ and walking the ‘Lagoon Walk’, are highlights. You’ll really get the authenticity of this place if you’re travelling outside the peak travel seasons (between April / May and September/ October). The Glenorchy area is starting point for key walks and hikes, such as the Routeburn Track and the Rees Dart Track. There are some fantastic choices for day walks as well. The Dart River Safari tour and Horse trekking options are also key attractions. 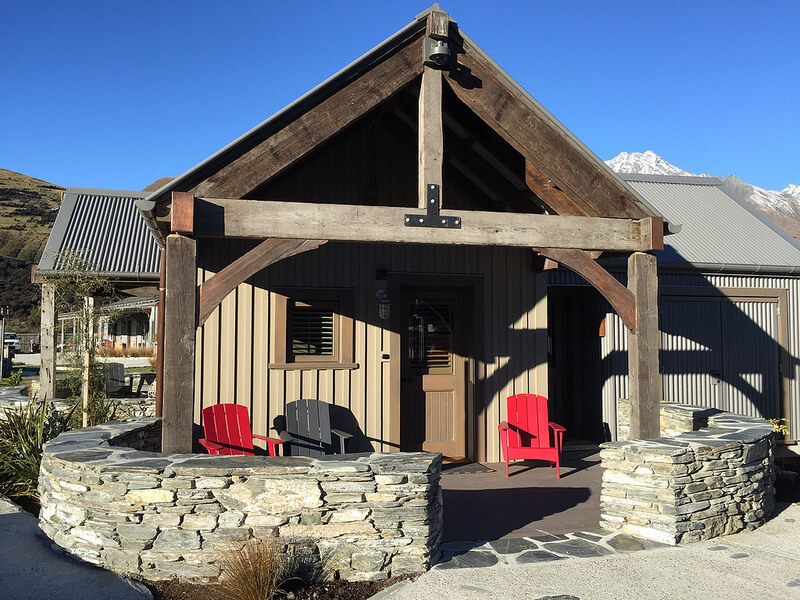 When I travelled recently to Glenorchy in June 2018, I stayed at the newly established ‘Camp Glenorchy‘. 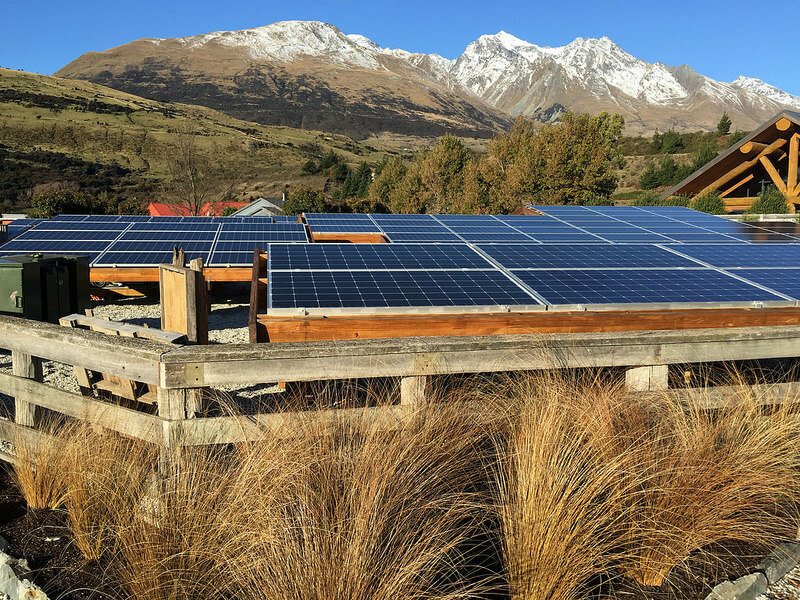 Camp Glenorchy is a huge complex which opened in March 2018 and is New Zealand’s first Net Zero Energy accommodation provider. Its unique and amazing! 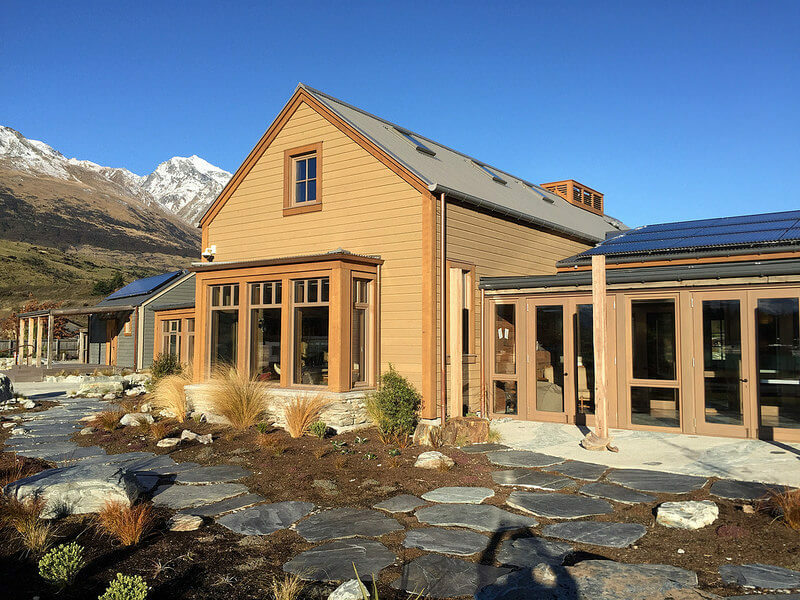 With conservation and smart energy planning at the forefront, Camp Glenorchy operates under the philosophy “Living Building Challenge’. This involves the most advanced environmental building design certification in the world! I stayed in the ‘Manuka Cottage’ and immediately felt the harmonious pairing of materials and ambience. No surprises here though – only chemical free building materials are used – many of which have recycled origins. The main building contains the small reception, a functional kitchen and very spacious lounge area. The polished concrete floors store the day sun. The atmosphere is calming with beautiful music playing in the the background. Large maps of the area invite the traveller to step into their explorer mode. At the moment, guests prepare their own breakfast. However, in the near future, Camp Glenorchy will provide a breakfast option at an additional cost. For travellers wanting an even more remote location, another option is Kinloch Lodge. Now this accommodation is a little more basic but very comfortable. The lodge rooms cater more for the backpacker market. For those requiring a more comfortable option, there are also eco cabins. I have seen the eco cabins and can recommend them, especially in Autumn when the camping ground below, is not as busy. Blanket Bay Lodge is one of New Zealand’s exclusive properties and is located on the lake itself. Guests staying here enjoy the utmost privacy and a premier level of luxury. What to do in the Glenorchy region ? Everyone is different and we all have varying ideas on how to spend their time in this pristine area. Some get active, others just seek peace and rest. 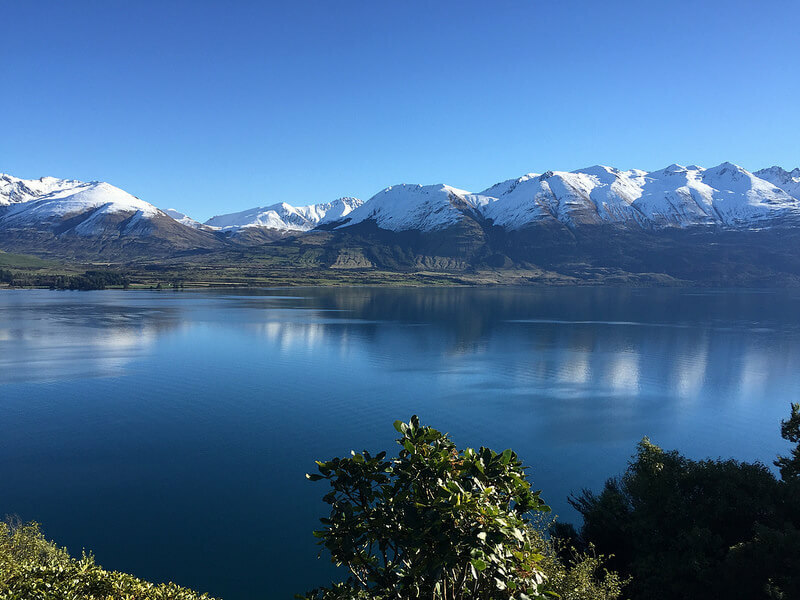 Here is a list of options on what to do in the Glenorchy area: hiking, day walks, horse riding tours, Dart River Safaris, Lord of the Ring Tours, Farm Tours, Kayaking, Fishing, Photography, Arts & Crafts, Scenic flights etc. 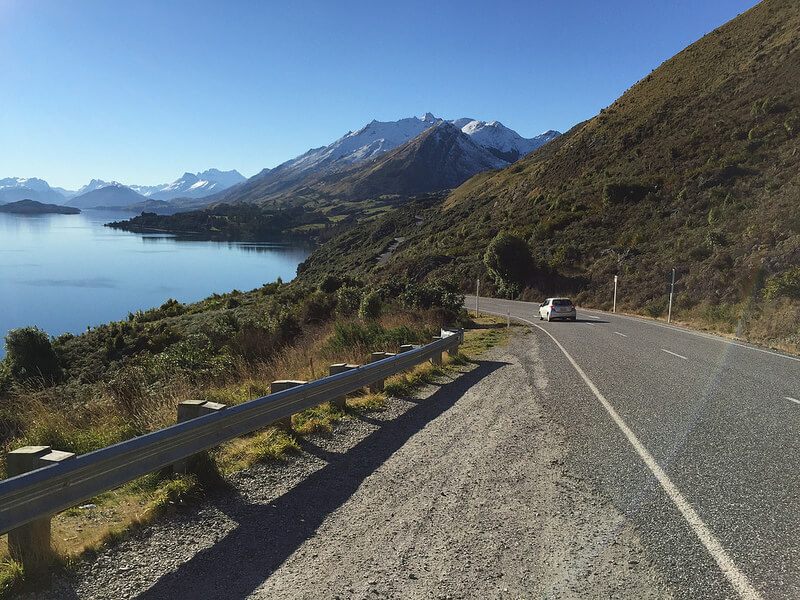 Glenorchy is a place for travellers wanting to get away from the frantic energy of Queenstown. Now, it is busy during the day time with hordes from Queenstown visiting, but is more relaxed from the late afternoon. Travellers have shorter access to some of New Zealand’s key hiking highlights and stunning scenery. One key advice – do make time. Any stay under 2 nights is not really worth it. Make sure you get to immerse yourself in the untouched paradise that is Glenorchy. Happy travelling and contact us if you have any questions! I’ve spent a lot of time in Glenorchy having lived in Queenstown for 18 years. It was always a favourite place to visit and as you say the gateway to many fabulous hikes both overnight or easy day walks. The scenery is breathtaking and has to be seen to be believed. Highly recommend including Glenorchy in one’s itinerary when visiting New Zealand. Great recommendation Jan – glad you love this pristine environment as much as we do. I think some of us are getting to the stage where we really need to connect to our natural environments – this certainly is the place to do it!